"I think the Belt and Road Initiative signifies a revolutionary move to a new epoch of civilization. The idea of having win-win cooperation among nations is the first time that a concrete concept has been offered to overcome geopolitics. This has instilled tremendous hope among developing nations that they have the chance to overcome poverty and underdevelopment. And I think this is an initiative that will grow until all the continents are connected through infrastructure and development." 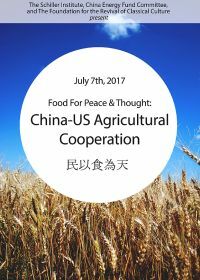 The task of the conference is to formulate food production and trade policy -- in the wake of the breakthrough Belt and Road Forum in Beijing, May, 2017 -- to immediately and radically EXPAND global food output and feed the world, catalyzed by the most advanced 21st century nuclear and satellite technology. American economist and scientist Lyndon LaRouche, the original designer, 29 years ago, of the "economic development corridor" concept and policy -- today, known as the World Land Bridge -- had stated in his 1983 study, There Are No Limits To Growth, that nations now have the capability, with existing technologies, to produce sufficient high-quality food to feed 25 billion people on a healthy diet! Furthermore, he pointed out that the development of Africa is of strategic importance -- that is, of strategic importance for Asia and for the whole world's peoples. Mr. LaRouche elaborated, then, the detailed policies to realize Africa’s potential for becoming both a "breadbasket" for the whole world, and a center of science and space research. Today, with 100 nations actively participating in China's Belt and Road Initiative, ‘the Road’ is open to do just that!